These lights are very efficient and last for long periods of time before you need to recharge them. Versatile and bright after you buy one you will come back for another! 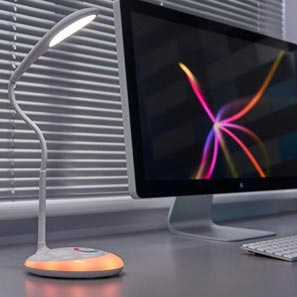 Many of these lamps come with a USB cable, you simply plug this in to your desktop and charge the lamps directly. The USB charged lamps come with a battery already on the inside of the unit. Some lights do have a battery compartment which requires batteries. Please check the specifications tab. Once charged you are completely cable free, so you can place the battery lamp wherever you need. With flexible heads and mounting options, you can get the light exactly where you need it. Great for studying and late night cramming, and because they are low voltage led lamps they save you a small fortune!